The shortage in fossil fuel resources has encouraged a huge effort towards the research of alternative sustainable energy. Within this framework, thermoelectricity offers the possibility to convert low-grade waste heat (including solar heating) into electric power. When a temperature gradient ΔT is applied to an isolated conducting rod, the electrons at the hot part acquire some kinetic energy and diffuse to the cold part, resulting in the creation of an electric field E=-ΔV=SΔT. The proportionality coefficient S is called “Seebeck coefficient”, from the name of the German physicist who discovered this effect. A tremendous effort is currently accomplished in the field of solid-state thermoelectric devices (more than 9,000 publications during the last decade). However, the research of new solid-state thermoelectric materials has reached its limits and most efforts are now devoted to the increase of the conversion efficiency through nanostructuration, which incurs a substantial manufacturing cost. Fig. 1 - Seebeck coefficients of various tetra-alkyl-ammonium ions in alcanes. The straight line represents a bare electrostatic contribution proportional to d(¼πεR)/dT, where ε is the dielectric constant and R the effective radius of ions. The much higher measured values are due to entropic effects related to the interaction of ions with the solvent. The alternative possibility—to use electrolytes instead of electron or holes as charged carriers—to convert a temperature gradient into an electromotive force is still underexplored. With electrons or holes as carriers the Seebeck coefficient in solid-state thermoelectric devices is only of a few hundreds of μV/K. But since it is proportional to the entropy carried by the moving charges, it could reach much higher values in electrolytes containing macro-ions. We have recently observed huge Seebeck coefficients up to 7 mV/K for tetra-alkyl- ammonium ions in alcanes  (cf. Fig. 1). The fluid sample is contained in a 14 mm high and 14 mm diameter cylindrical Teflon cell, with both ends closed by sapphire windows. The cell is positioned vertically and heated from the top by a thin film resistance. The lower window is maintained at a constant temperature. Two platinum or carbon-glass electrodes are inserted in electrically insulating tubes and positioned horizontally with their exposed flat tips (~1 mm in diameter) placed 6 mm apart along the vertical axis. The temperature gradient along this axis is verified to be stable. The open circuit voltage ΔV between the two electrodes is measured via a high impedance electrometer. These unprecedented S values are unfortunately compensated by a poor electrical conductivity which lowers the figure of merit. We are now focusing on binary mixtures of ionic-liquid/organic solvent whose ionic conductivities are closer to the electronic conductivities achieved in solid-state thermoelectric devices. Such binary mixtures are now widely used in lithium batteries and supercapacitors. 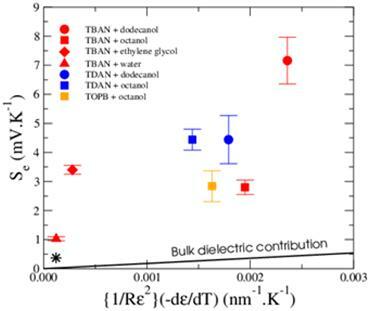 After adding a redox couple which allows a reversible exchange of electrons between the liquid and the electrodes, we have observed a strong enhancement of the associated Seebeck coefficient at high ionic-liquid concentrations . Charging of Li cells or supercapacitors through a temperature gradient, using ionic- liquids/organic-solvent binary mixtures and electrodes coated with active carbon. The combined thermoelectric and magneto-thermic effects in charged ferrofluids. The enhancement of the Seebeck effect due to entropy change at the phase transition in thermo-sensitive colloidal suspensions.